The Strata of Memory series is a collection of media artwork that touches on the difference between the materiality of analog and digital media and the entanglement between the two, with an emphasis on their techniques of operation. 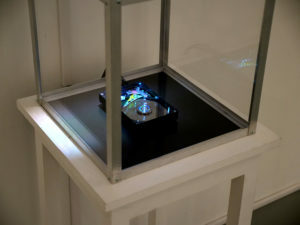 In the work, The Reflected Lost, the hard drive (database) feeds the projector with a sequence of random videos which are then projected on a dusty glass surface. 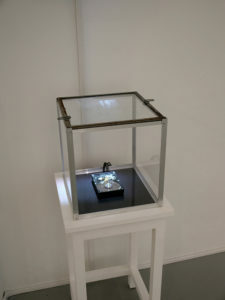 Here, the material body of the hard drive creates a symbolic circulation between the videos from the database (a representation of memories) and the screen.